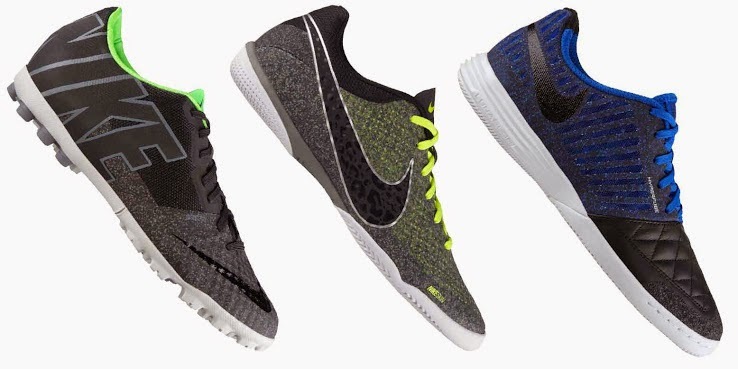 Nike has released a new autumn 2014 colorways for their Nike Elastico Finale II, Nike Bomba Finale II and Nike Lunar Gato II. They are going with darker colors than their summer releases. The Nike Elastico Finale II is designed for hard surfaces, and features a flexible outsole. This new boot is perfect for futsal, or a gym surface. The new Elastico is made from NikeSkin. This will provide the boot with support and comfort, making it one of Nike’s lightest indoor boots made to date. In September, Nike will unveil their Nike Elastico Finale III, which will also be available for turf surface, and also an Elastico Finale Superfly. Nike Lunar Gato II is also a design perfect for hard surfaces and small sided games. It is made with goat leather upper part for more consistency and endurance. It will feature a NikeSkin upper area with all conditions control technology for better ball control in any conditions. This is a perfect boot for turf fields, when playing small sided games. This looks to be the last colorway for Nike Bomba, since they are looking at replacing it with turf versions of the Nike Elastico.